Painter, probably of German origin (Sax indicating Saxony), who worked in Valencia. 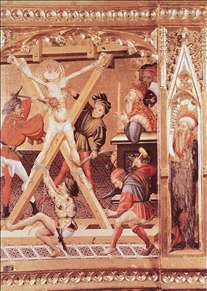 Only one fragment survives of his documented works - the Incredulity of St Thomas in Valencia Cathedral, part of an altarpiece he completed for the cathedral in 1400. Among the works given to him on stylistic grounds the most important is the huge and sumptuous retable of St George (Victoria and Albert Museum, London), featuring the varied tortures of the saint in grisly detail. 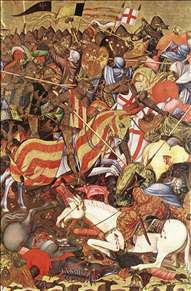 The somewhat rough vigour of Marzal de Sax s style had considerable influence in Valencia; he is last mentioned in 1410, impoverished and ill, receiving free lodging from the city in recognition of the quality of his work and his generosity in training local painters. 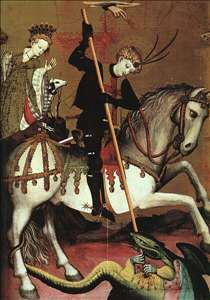 See more details about "Retable of St George "